If you don’t know where you are going, any road will lead you there. Tuesday, February 23 through Tuesday, March 1, 2016-Potrero, California-Part #2: We only spent 7 days here at Potrero, but we enjoyed the park and the experiences we had overflowed my self-imposed journal length of 20 pages on the previous episode, so this issue begins with the rest of the story! 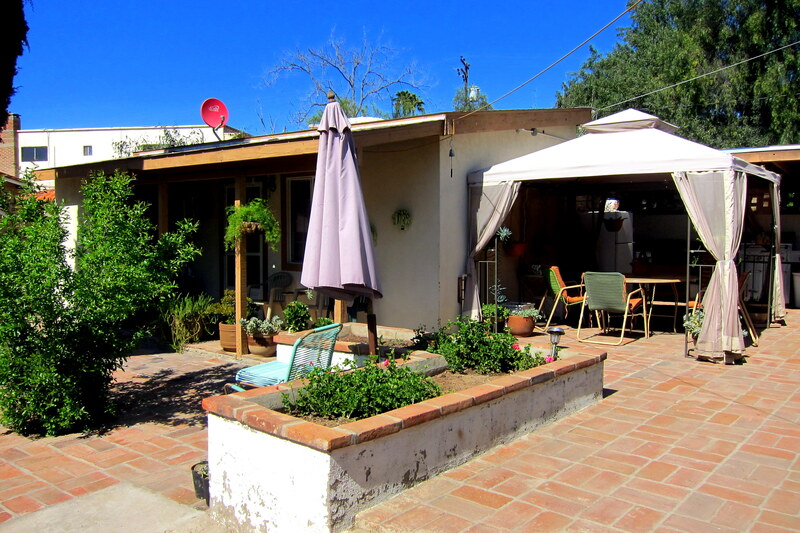 Kit and I have a very good friend from our childhood days that resides with his wife in Mexico, a short hop across the border from where we are camped……and one day, they invited us south for a visit! 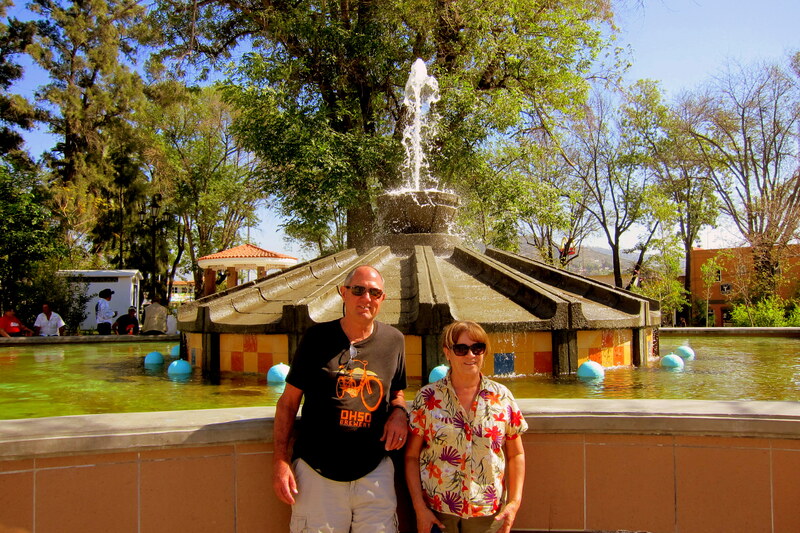 Rodney and Gloria live in the small Baja California town of Tecate…..yep, that Tecate! 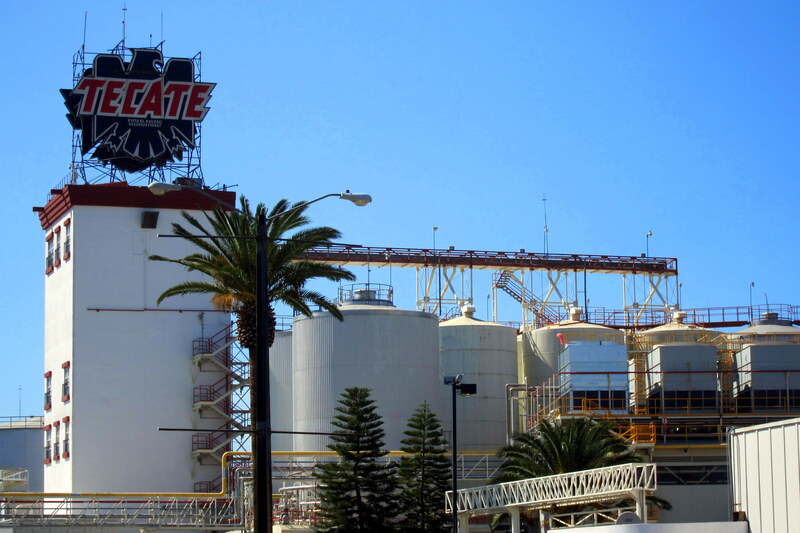 A premium beer, Tecate has been brewed in this town since 1943 and is credited with starting the lime in the beer craze of the past few decades. As the story goes, British sailors during the days of sail where given lime wedges with their daily ration of grog to stave off scurvy…..and the combination of flavors endured. So the founders of Tecate Beer started recommending their bartenders try this pairing with modern sailors that visited from the Navy Port of San Diego, and so the “lime in a beer fad” began! Rodney and Gloria reside in a compound that Gloria inherited from her parents, and has been in the family for generations. 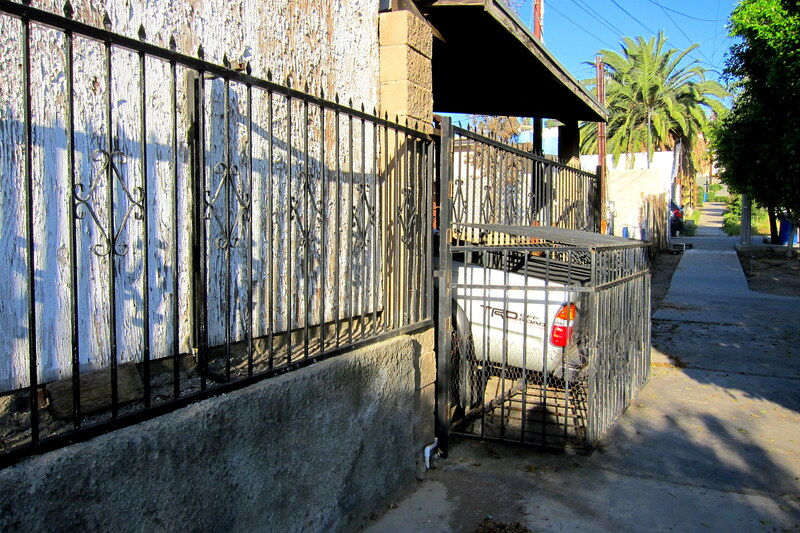 It consists of four nice homes surrounded by an attractive wall and covers on most of the city block. 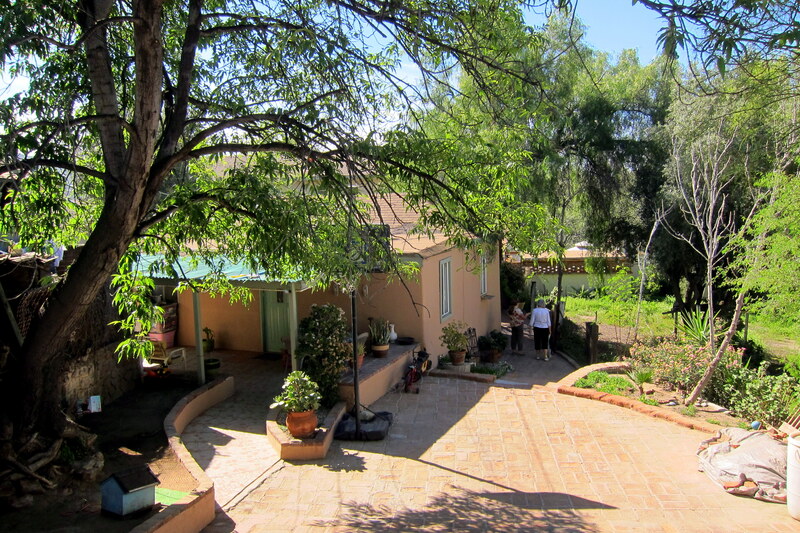 Over the year the compound has been lovingly restored by Rod and Gloria. 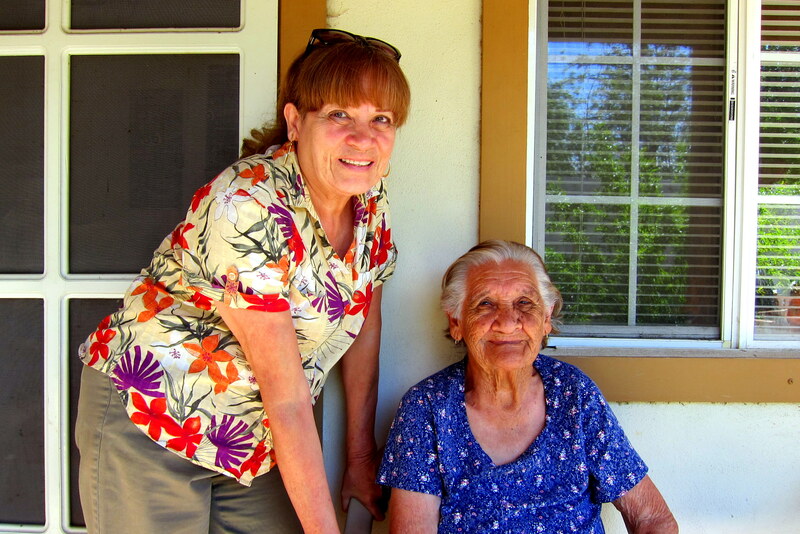 Gloria was born in one of the homes as was her 100-year-old mother Minga, who still resides in a casita on the family compound. Rod and Gloria treated Kit and I to a tour of Tecate. 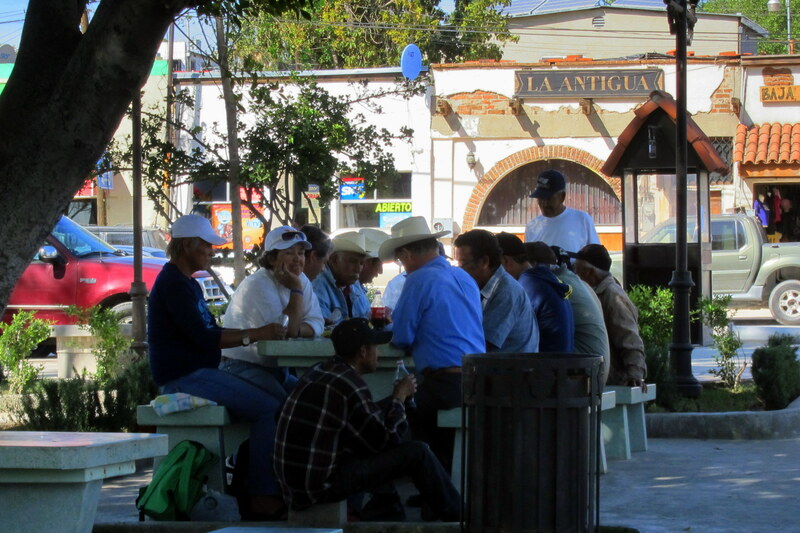 A town of 65,000 that is far more authentic then most border towns we have experienced. Absent are the many tourist shops selling Mexican souvenirs made in China and the rows of seedy bars…..in fact I didn’t see one donkey sporting a sombrero waiting for a tourist photo opportunity in the entire city! However, there is a very pleasant town square, complete with old retired guys playing chess! 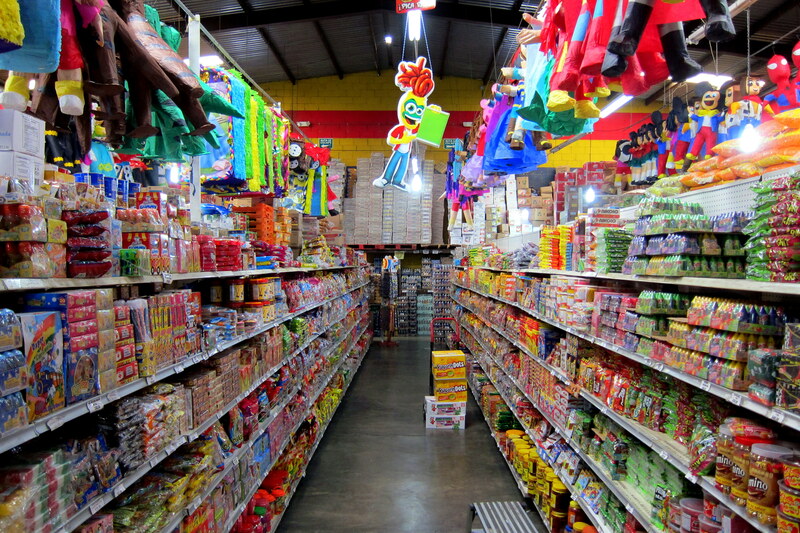 The tour included a famous shop that sells authentic Mexican made piñata’s, with everything one would want to fill them with. They then treated us to lunch at a very nice restaurant that was owned by a friend of Gloria’s from her childhood days. 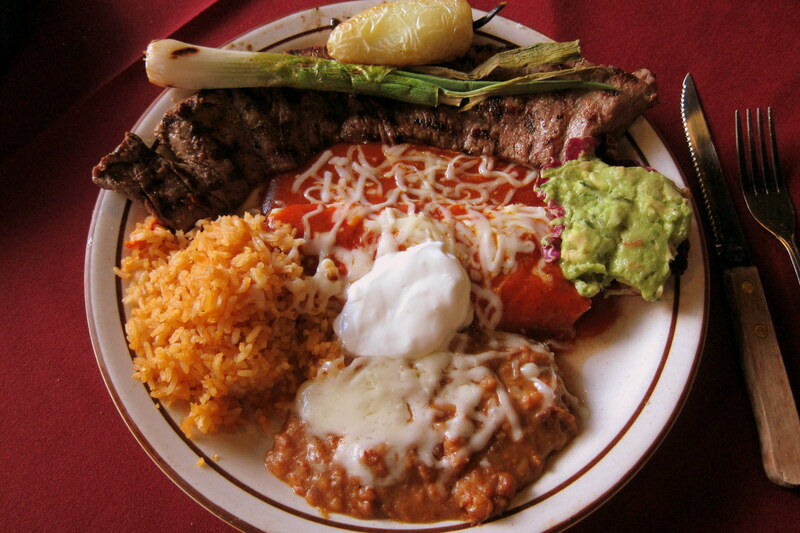 I enjoyed Carne Asada with two enchiladas’, beans and rice…..it was incredible! 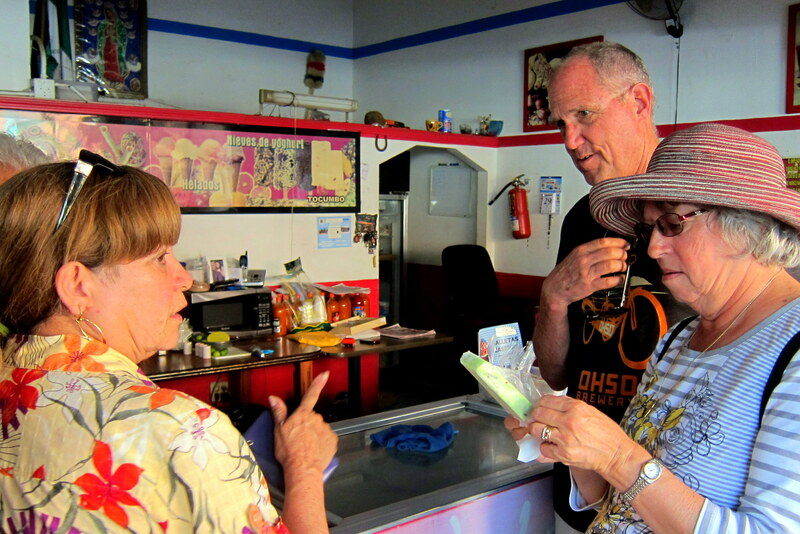 For desert, we visited another of Rodney and Gloria’s favorite places for Paletas, a delicious frozen dessert. 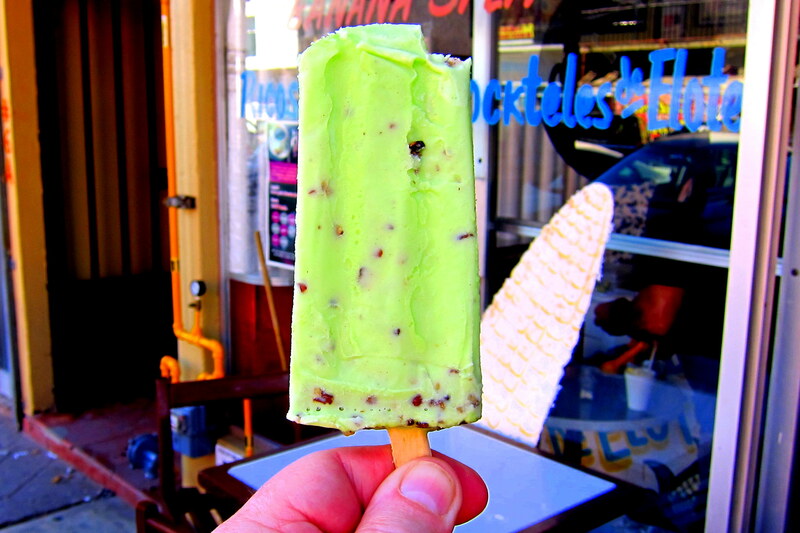 I selected a Neapolitan Paleta, and it featured a very good, but intense flavor…..one could make a meal out of these things! 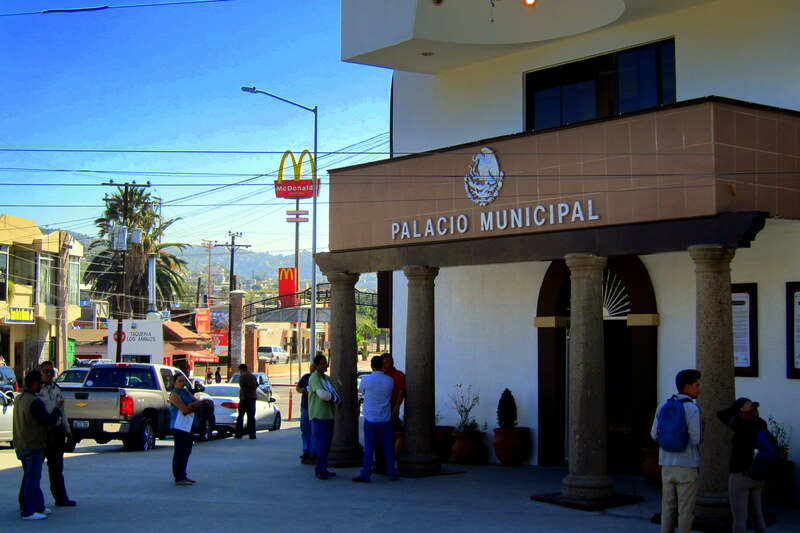 In Tecate, Rodney explained that property rights and zoning laws are far different then in the U.S. And differ still depending who is in power and who has the most influence with those with more power. There have been cases where a neighbor has cantilevered his home addition into the airspace of his abutting neighbor! And got away with it, because well…..no one in Mexico can lay claim to the air above their land!?!? Then there was the example we stumbled upon while walking about town. Apparently if you have a gated driveway, and you buy a longer truck, and if you have influence, then it’s perfectly acceptable to extend your gate onto the public sidewalk! We had a great time visiting with Gloria and Rodney in their home and experiencing their nice hometown…..but getting late, it was time for us to head back north of the border. So, Rod walked with us along the infamous fence that separates the two countries. 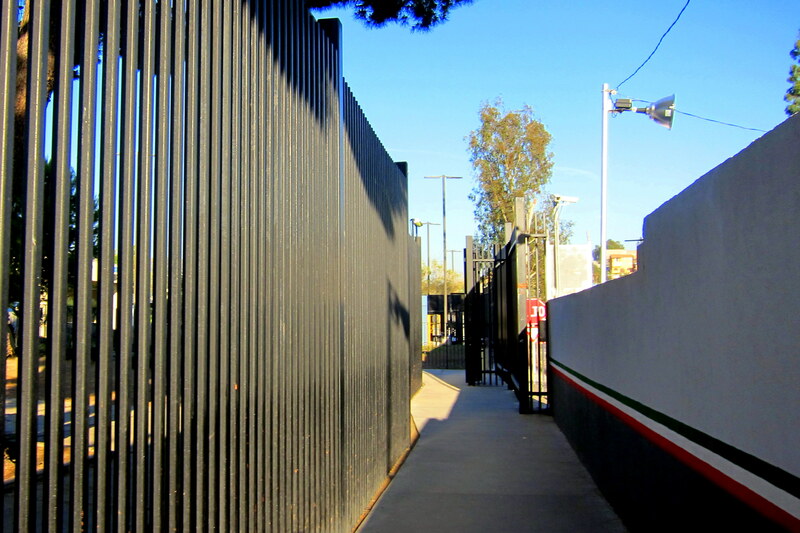 It’s kinda sad that a barrier fence exists on the southern U.S. Border….no such fence separates the U.S. from Canada! In fact, there are towns in Northern Maine that share the border with their Canadian neighboring town, and there is very little restriction to movement back and forth! 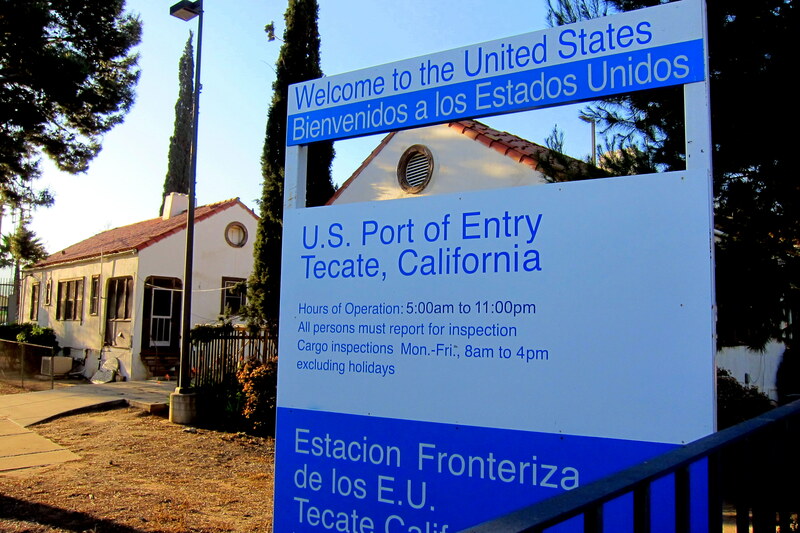 Rod, bid us farewell at the Port of Entry, while Kit and I fumbled for our passports as we stepped over the man-made line of demarcation that defines what belongs to America and what belongs to Mexico. We had a great time in Mexico, seeing the sights and visiting with some great friends…..thanks guys! 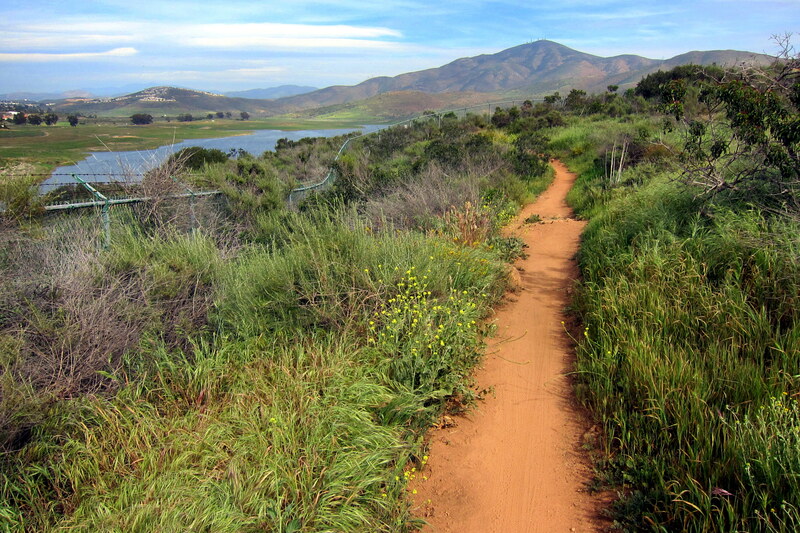 Potrero Regional Park has become one of our favorite municipal campgrounds. 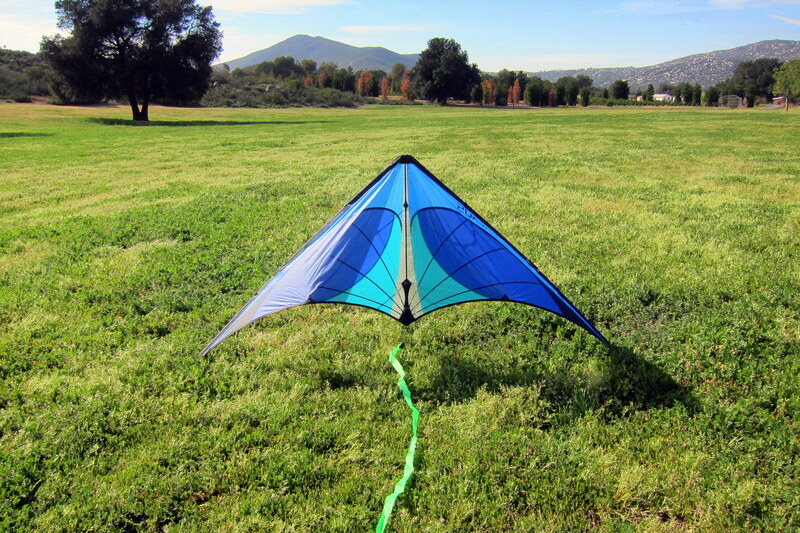 In addition to the many attributes previously mentioned, there is a nice field for kite flying! Even though we are 40 miles from the coastal sea breezes, the winds were quite good for flying a few of my smaller kites. Well, tomorrow we continue our camping tour of San Diego County. After a nice meal and a few cocktails, Kit and I relaxed outside as the sun set over the Laguna Mountains. 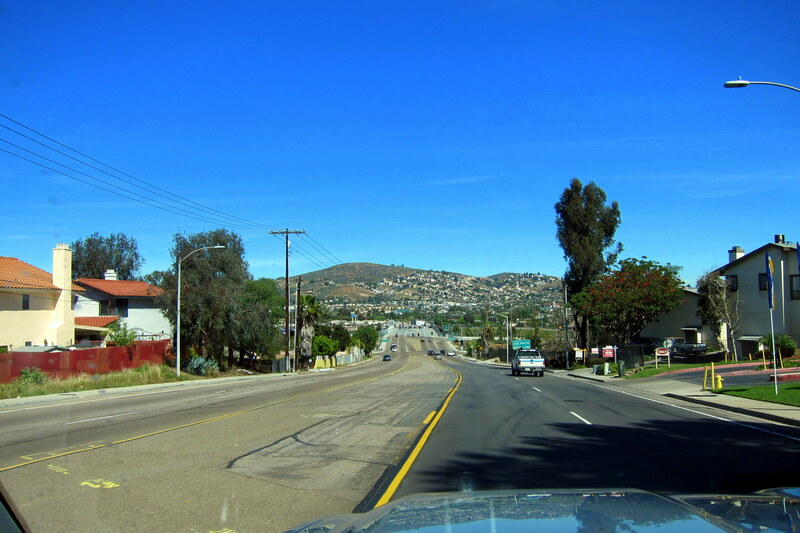 Wednesday, March 2, 2016: It is sunny and 75 this morning as Kit and I head west on CA-94 to Jamul before jumping to Otay Lakes Road toward the San Diego County town of Bonita. And finding our way to Sweetwater Summit Regional Park, we checked in, selected a site and set up camp for a week’s stay as the sun set to the west. 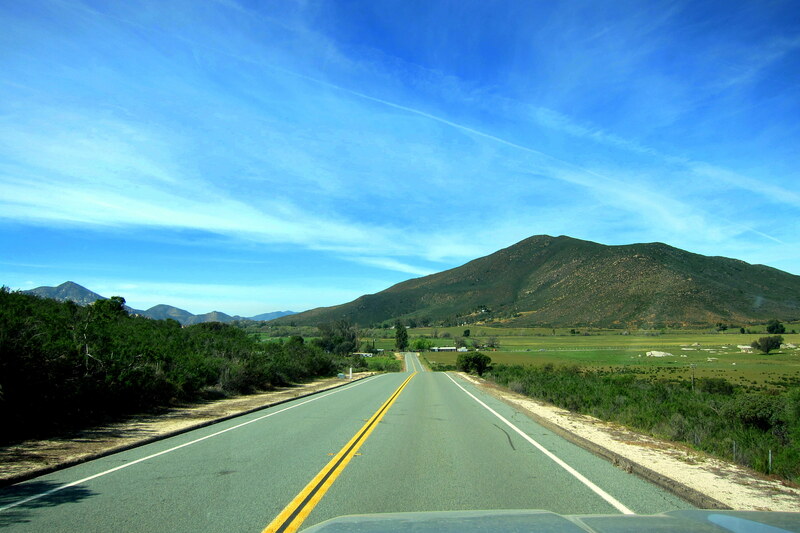 Tuesday, March 3, through Tuesday, March 8, 2016-Bonita, California: The town of Bonita is located to the southeast of downtown San Diego and is where my family lived in at an old farm house when I was a mere five years old. I remember back then riding a big yellow school bus spewing diesel exhaust fumes as I made my way to kindergarten. Funny, how various sights, sound or smells will transport one to an earlier time…..for me the sound and smell of a diesel engine takes me right back to that era. The farm had been a rather successful chicken growing operation judging by the multiple rows of low coops that my brother and I used as our playground. A very old house by San Diego standards, there was an out of commission outhouse on the property but the “indoor plumbing” was housed in an addition stuck on the back of the place. 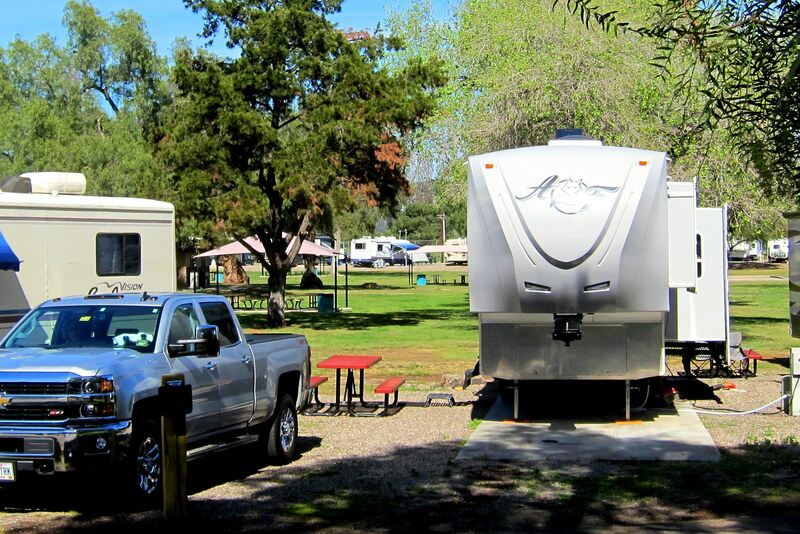 The campground at Sweetwater Summit Regional Park was well laid out with large sites spaced a nice distance apart. 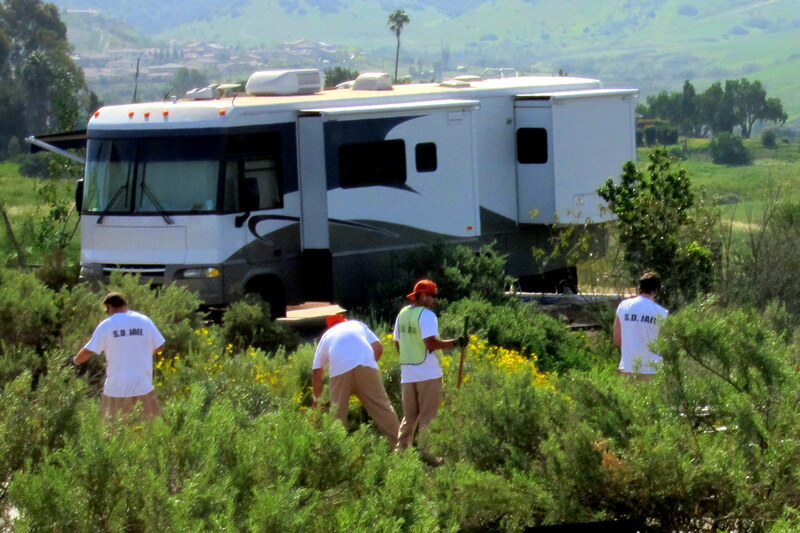 The park was very nicely landscaped and was kept looking tidy by the help of young inmates from the San Diego jail. While in the area we wanted to visit with some folks that had moved here from Maine. 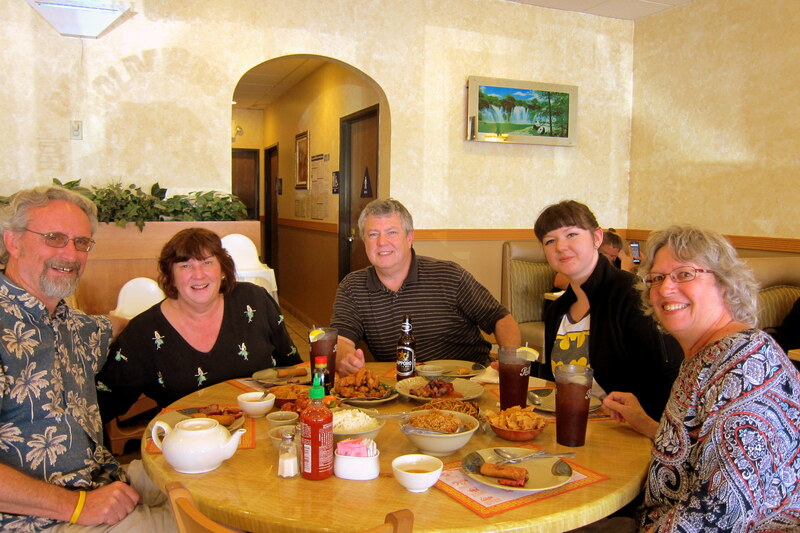 We arranged to meet up with Scott and Marie at a nice Asian restaurant close to their home, and when we walked in Kit and I were pleasantly surprised that their daughter, Libby was able to join us as well! Scott and I worked together for Lockheed at Bath Iron Works testing the new construction Arleigh Burke Aegis destroyers that were being built at the yard. As the program was coming to a close, Scott took a management position with Lockheed here in San Diego, overseeing the modernization of the earlier generation Aegis ships. 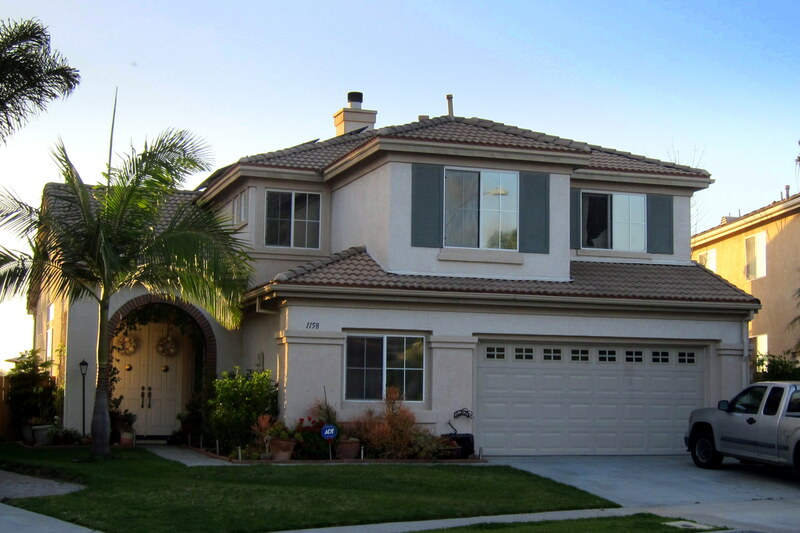 Marie is the family CEO and works hard at making a life for her family in their beautiful hillside home. Libby works in Los Angeles as a fashion designer and will most certainly have her designs on the worlds runways in the near future. Following a great meal, and even better conversation, Scott and Marie invited us back to their beautiful home for dessert and coffee. 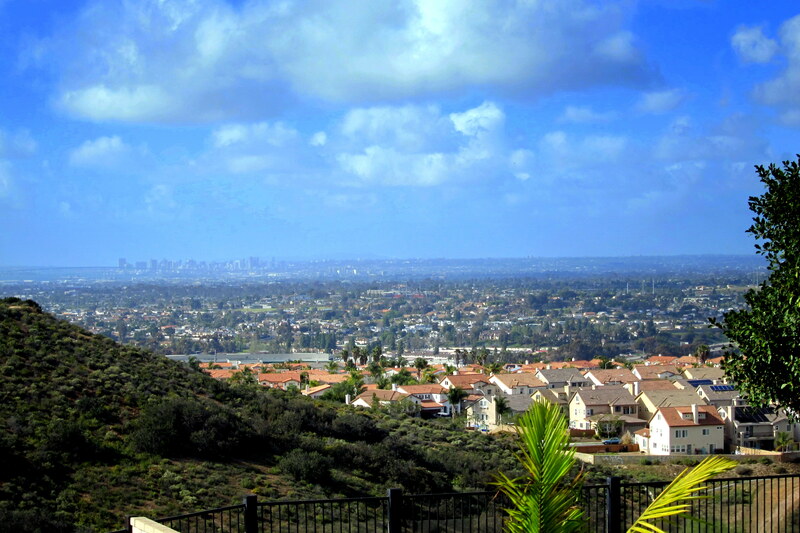 Where they enjoy an incredible view of downtown San Diego, the bay, and on a clear day, the Pacific Ocean beyond. Thanks, folks for taking time to spend with us….we had a blast! Kit and I spent a considerable amount of time just hanging around the campsite and enjoying the features of Sweetwater Summit Park, one of which was an incredible multi-use trail system. Where I went out on my bike a number of times during our stay, to explore the countryside. 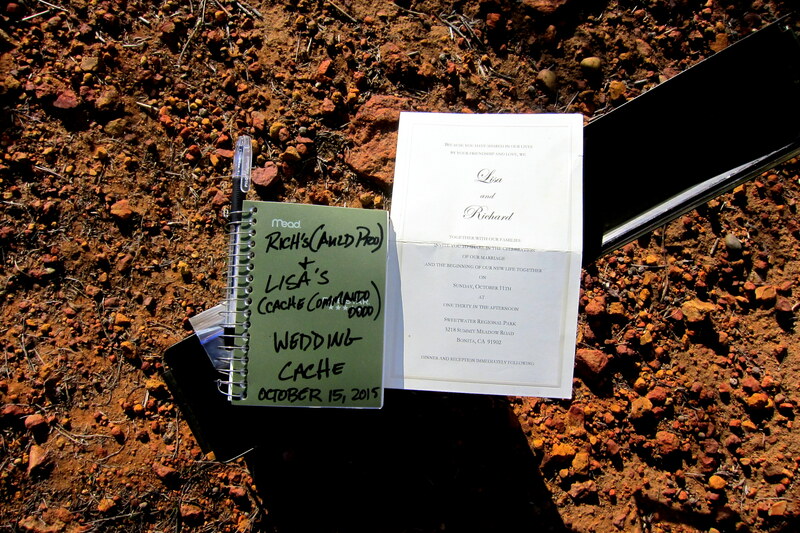 At times, combining it with Geocaching, where I located the below wedding cache. 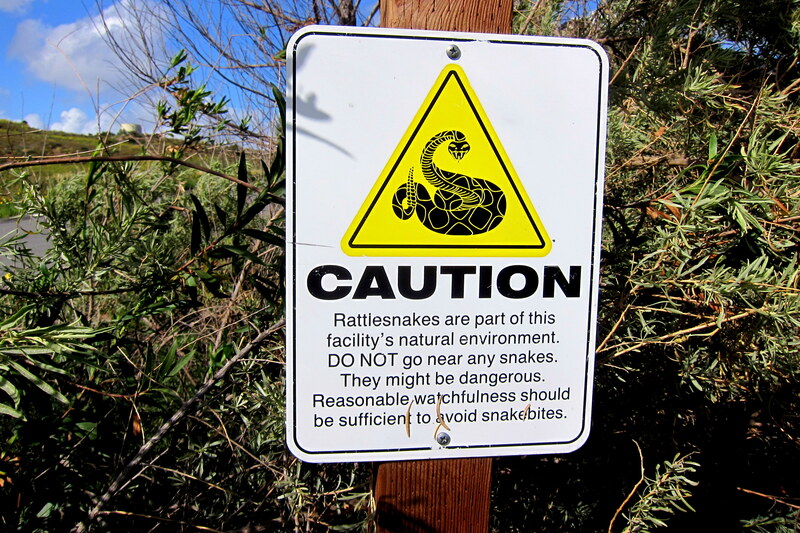 However, ever mindful of the many signs posted alongside the trail, I keep a constant vigil for slithering critters. Good thing as I almost ran over this fellow! When I noticed him/her (I didn’t bother to look!) 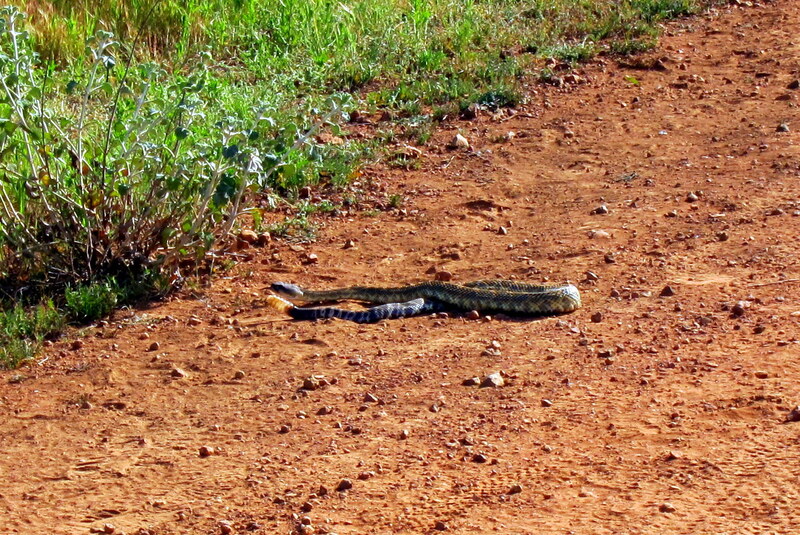 he/she was stretched out across the trail almost taking up the entire width. Initially thinking it must be a stick in the way, I was preparing to roll over it then the stick moved! I came to a sliding panic stop about 3 feet away…..notice my tire tread in the photo above? I quickly started pushing the bike back while straddling the cross bar…..must have been a funny sight! Before I could un-holster my camera, the Diamond Back, made a U-turn and started to retreat into the trailside underbrush. Guess my geocaching is over in that area for today! 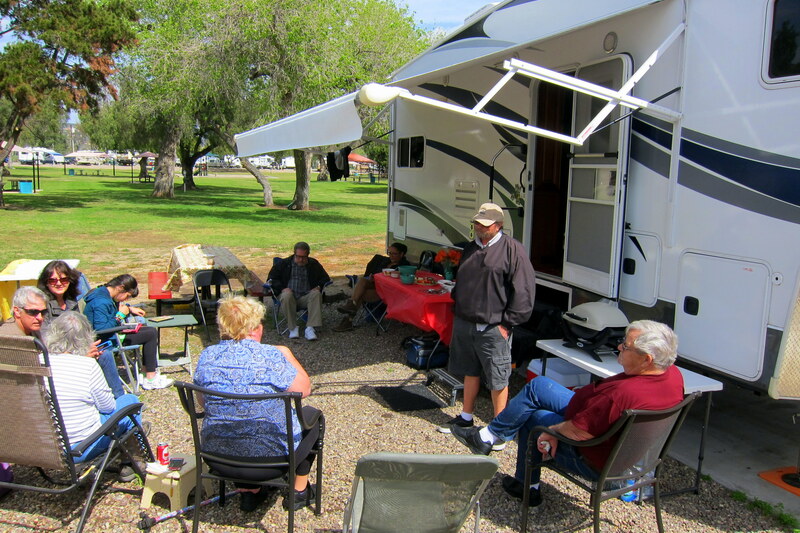 We also took a number of walks about the campground…..it’s always fun to see where folks are from and what type of rig they are using to RV with. A popular option out here in the west is the Class A (think bus) motorhome, some of which exceed seven figures. ­­ And most of these rigs tow small car or truck (called a “toad” in the RV vernacular) as a get-a-round vehicle when camped. Over the years we have seen folks tow basic sedans, or a small truck or jeep, and some tow fancy sports cars in enclosed trailers, then there are a few who tow a classic car or hot rod, like these folks! 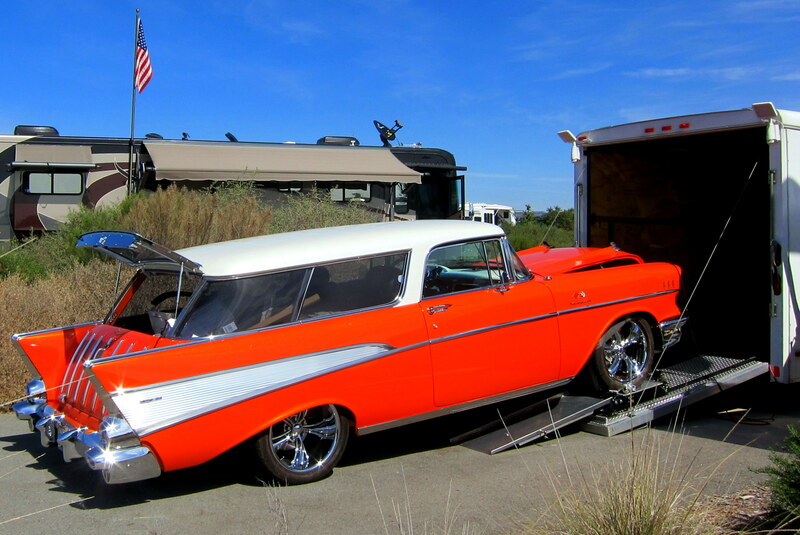 Yep, that’s a 1957 Chevrolet Nomad and it’s powered by a modern Corvette engine and drivetrain, and it sounds mean! Being close to the Navy base at 32nd Street Kit and I took advantage of the shopping opportunities to re-provision and browse about a bit. Kit’s penchant for shopping exceeds my tolerance level, so frequently I walk about the area while she walks about the store. Nearing the shipyard as the sun was setting I snapped this interesting composition. I’ve often thought that a sunset enhances an otherwise mundane object or landscape, and the above photo goes to prove that point. 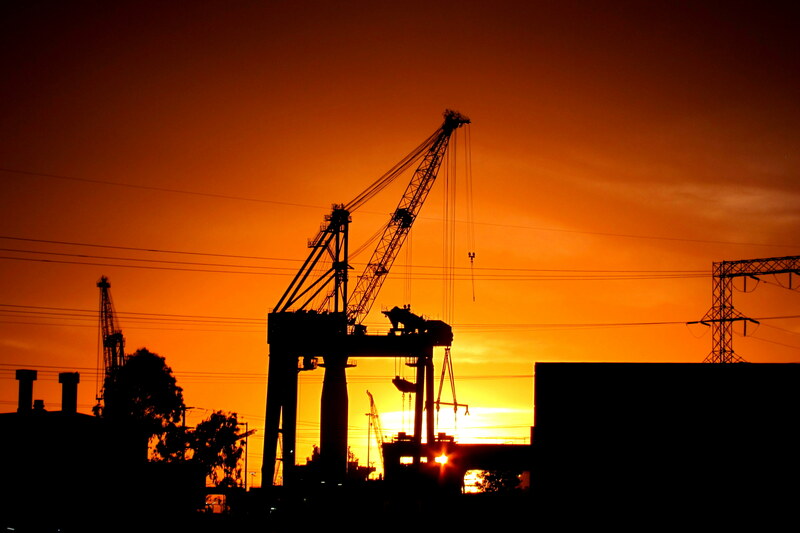 Even a gritty industrial scene can take on a magical quality when being back-illuminated by the sun. On one nice warm day, Kit and I decided to explore the southern coastal border of San Diego County. 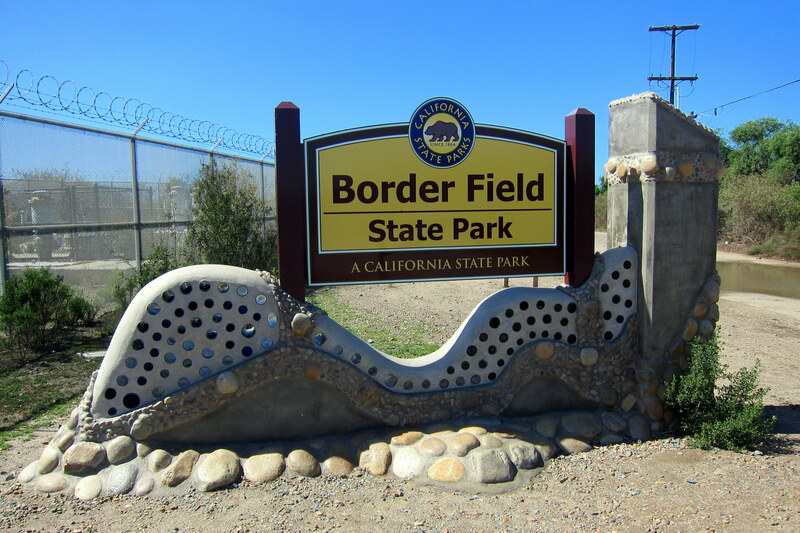 Our first stop was at the aptly called Border Field State Park. 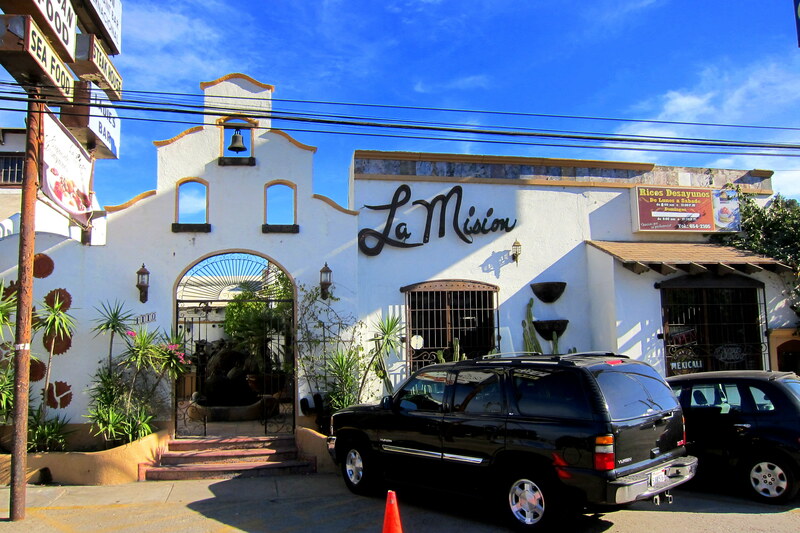 Sitting hard on the Mexican border and paralleling the Tijuana Slough, a great surf break back in the day…..if you didn’t mind the raw sewage coming down the Tijuana River. Today it has been cleaned up and houses an international wildlife sanctuary. 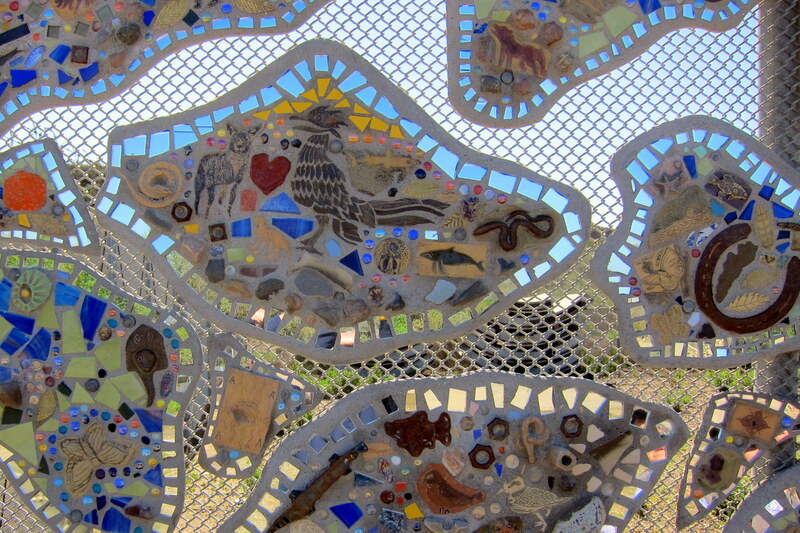 The trail to the beach was impassable due to the effects of the recent high tides, so Kit and I stayed within the park and enjoyed some of the art worked affixed to the fence by local schoolchildren using mostly found items along the beach. Next, we drove north up the Silver Strand and stopped at one of our other favorite camping opportunities in the area, Fiddlers Cove Navy Marina and RV Park. 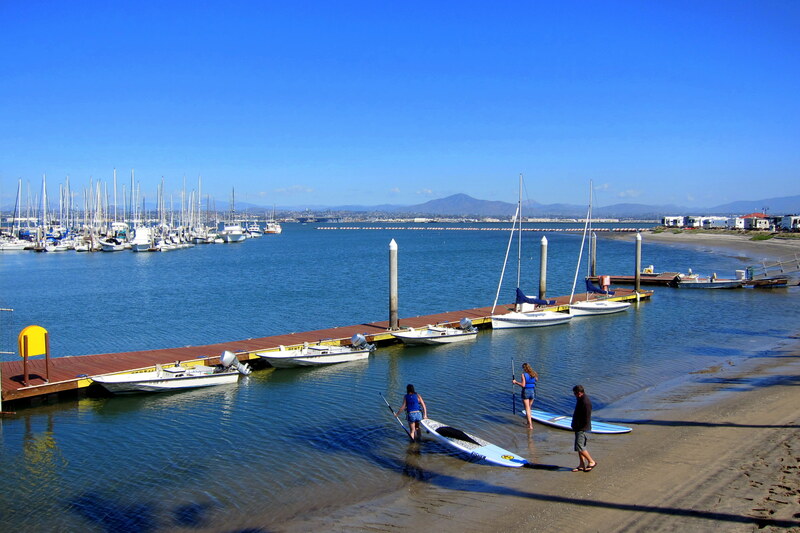 In addition to a nice marina with a variety of powered, sail, and paddling watercraft for rent, this is one of the nicest military campgrounds in the system and the view across San Diego Bay and beyond is incredible. OK, I slipped a Navy ship in there…..so, what did you expect? We have only been able to score a stay once in the past eight years, as folks queue up to make reservations a year in advance and we just don’t plan that far ahead…..actually planning a day ahead is a stretch for us! 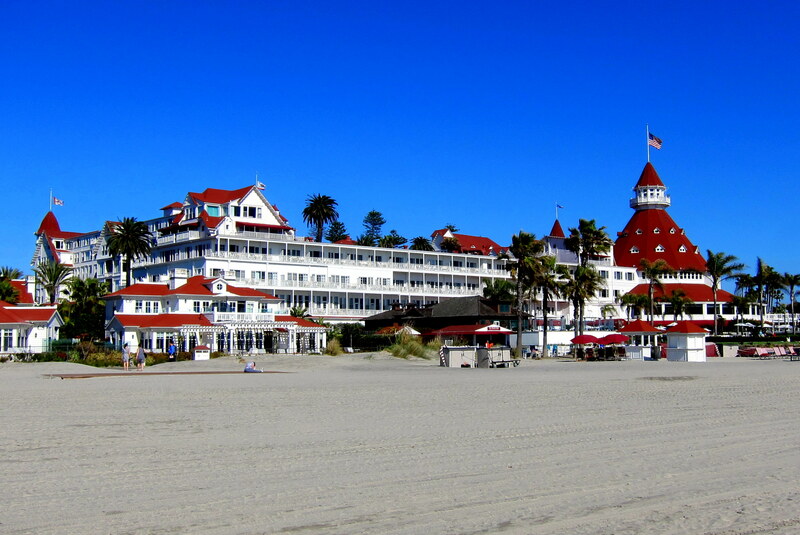 Continuing up The Strand, we entered the town of Coronado, home of the iconic Hotel Del Coronado. While Kit engaged in some “Retail Therapy”, I grabbed a few kites and headed to the beach. As I stepped onto the sand, I noticed the usual signs about safety and littering, but there was a restriction posted that was new to me, “no kite flying”. What the…..Drat! Trying to decipher the rational for this seemingly ridiculous regulation I was intercepted by a number of low flying US Navy helicopters heading over the beach toward North Island Naval Air Station. So, tucking the kites under my arm I walked the length of the beach to see what I could find……that was when I came upon this item of nautical necessity! 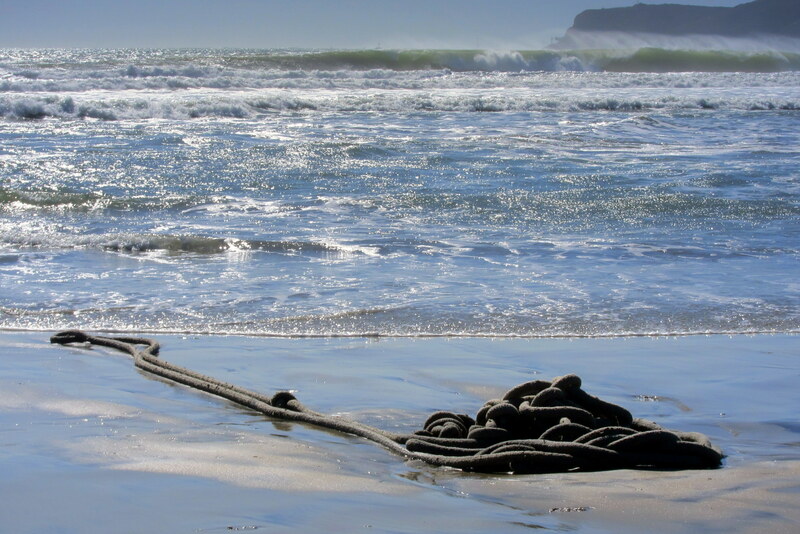 That folks, is a six inch mooring line from a rather large vessel, possibly a US Navy warship! Some skipper is gonna be upset when he maneuvers his destroyer alongside the pier and is minus one mooring line! 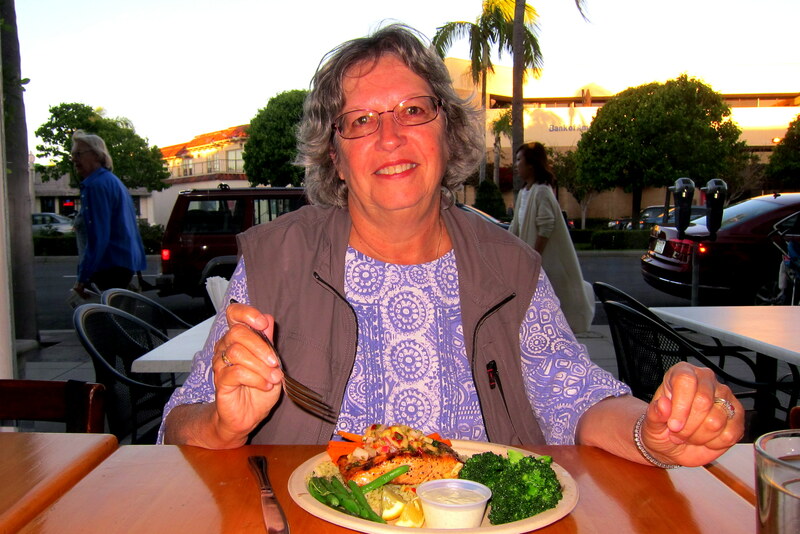 Later in the afternoon, I met Kit at the Islander Restaurant for a fresh seafood dinner. 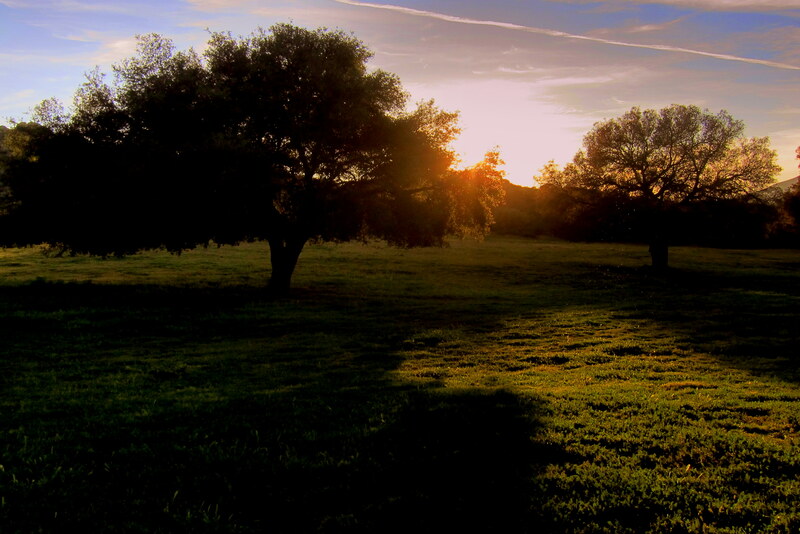 Returning to the campground, we sat outside as the sun set on a fantastic week at Sweetwater Summit Regional Park. Wednesday, March 9, 2016: This morning finds our erstwhile travelers underway for points north. In a mere forty-five minutes we pull into Admiral Baker Field and set up camp. Yep, again! 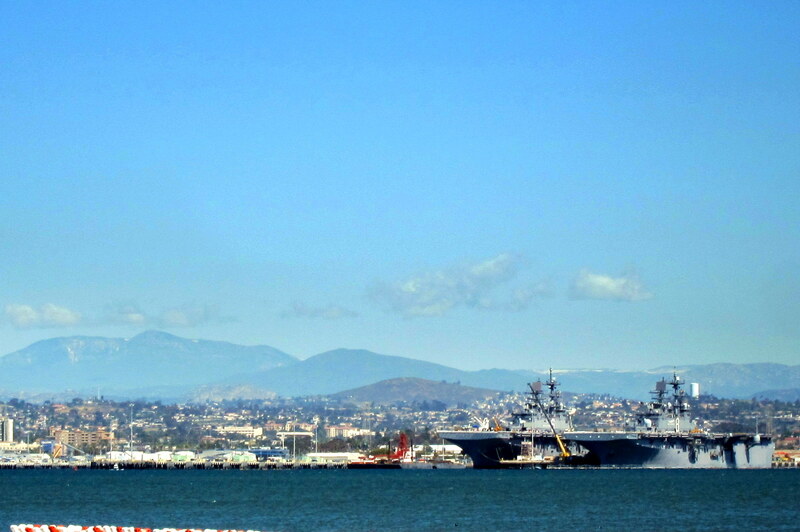 However, there is a valid reason to return to this Navy Campground in Mission Valley! You see, in a departure from the traditional Kit and Bill travel philosophy, we made reservations for the following week at Del Mar Beach Resort up in Oceanside. So, why didn’t continue to make up our itinerary as we travel along, you ask? Well, grandsons Jack and Tucker are coming over from Vegas on spring break. Their parents are arranged for them to join us on the beach for a camping adventure…..Kit and I are really looking forward to that! So, how do we spend the next few days until our reservations kick in? Keep reading! 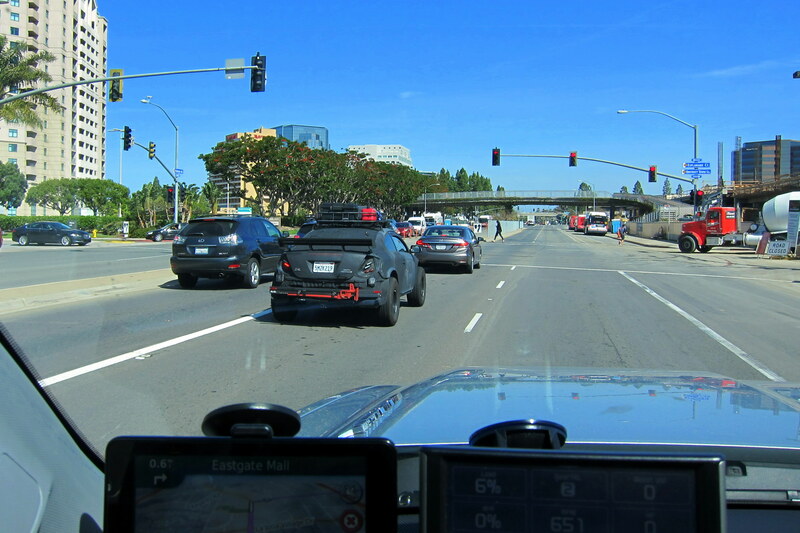 Thursday, March 10 through Tuesday, March 15, 2016-Mission Valley, San Diego, California: These six “bonus days” were spent doing the mundane but necessary tasks of daily living…..yep, still have to grocery shop, do laundry and clean the trailer and truck. In addition, we took time to catch up on some reading and paid the monthly bills via electronic bill pay. I also spent a lot of time organizing and editing photos, while writing the Travel Journal. While attending to the chores, we were out grocery shopping one day when I noticed these delicacies! Who knew that the meat of my childhood was now available in so many varieties? 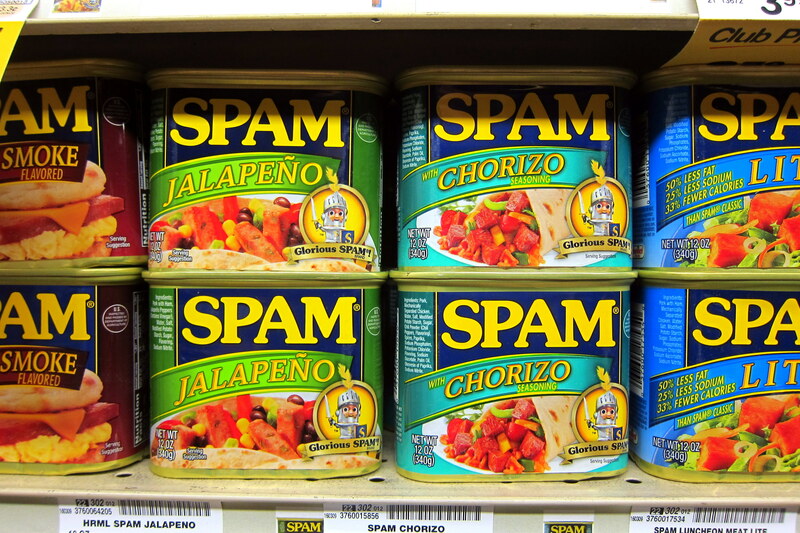 I was tempted to buy a can of each and perform a taste test, but the thought of eating Spam when I no longer had to, was distasteful (pun intended). On one nice sunny California day (yea, I know the words “nice”, “sunny” and “California” are redundant), Kit and I hosted a campground picnic for her family. 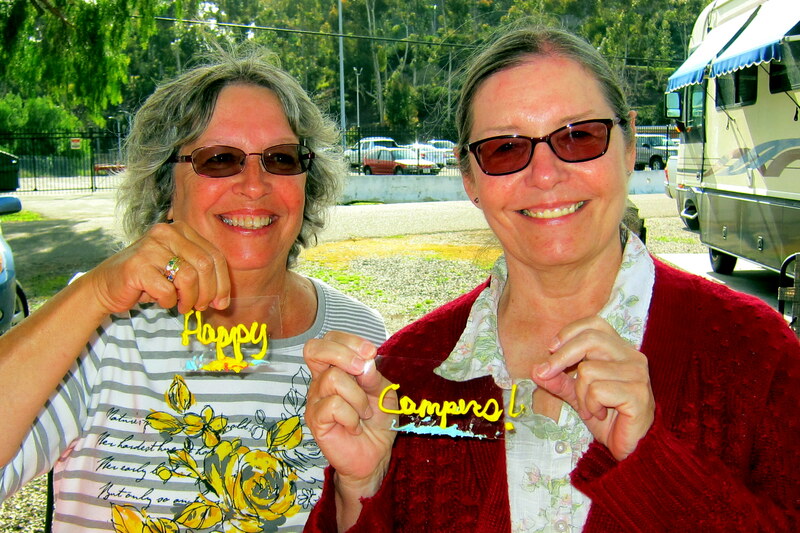 We had a great time visiting, eating, drinking, and celebrating the folks that have discovered the RV’ing lifestyle. 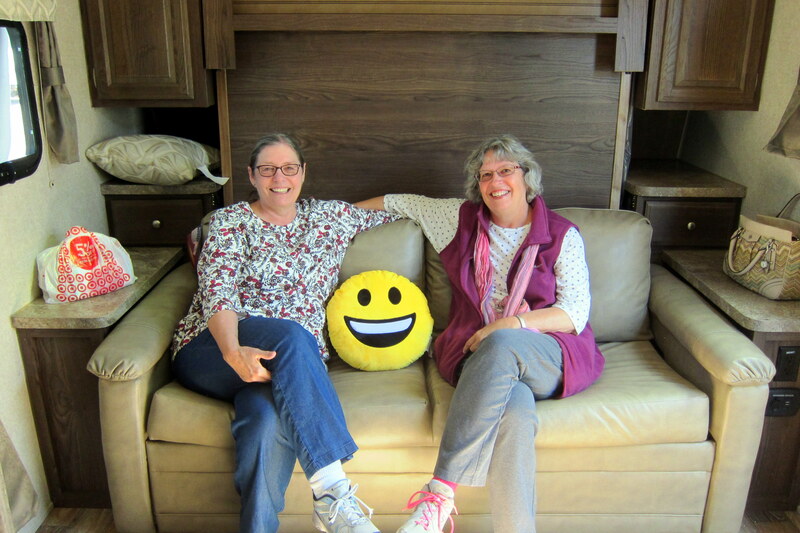 Yep, that smile on sister Chars face reflects her pleasure in being an owner of a brand new RV! 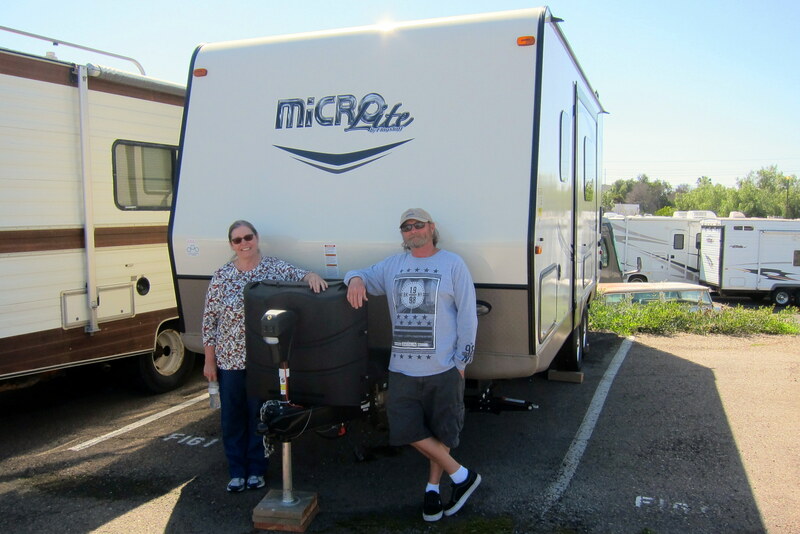 Char and her husband Don recently purchased a very nice towable that will fit their interest in camping at the Sierra Nevada Mountains. It features a Murphy Bed system that converts to a comfortable couch by day. 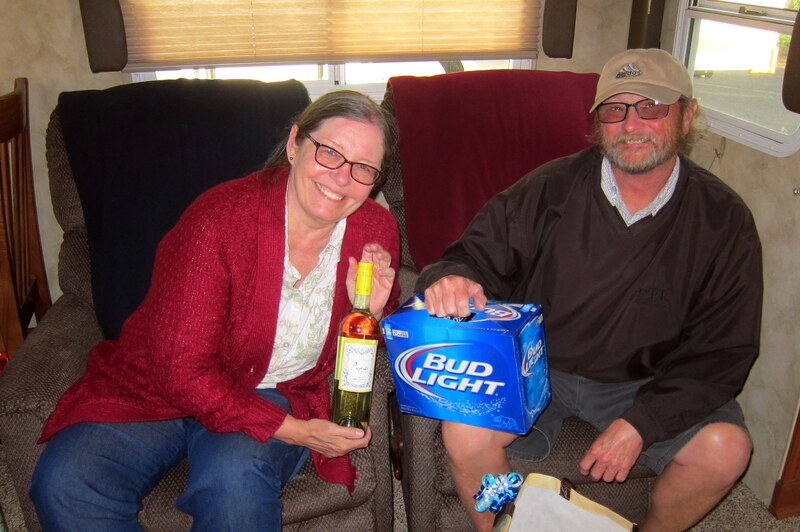 Kit had gathered a number of RV’ing necessities and put them in shopping bags emblazoned with RV themes then presented Don and Char with this “Trailer Warming” gift……and when we said necessities, we meant truly needed RV’ing items! Congratulations, Don and Char…..welcome to a wonderful world of traveling opportunities! We were able to spend more time with Ron and JoAnne as well. JoAnne, a former professional landscaper, cares for a beautiful garden in her backyard and brought Kit a colorful offering from that garden. While Kit, dug up some old 1960’s photos of the two of them which we framed and presented to her. 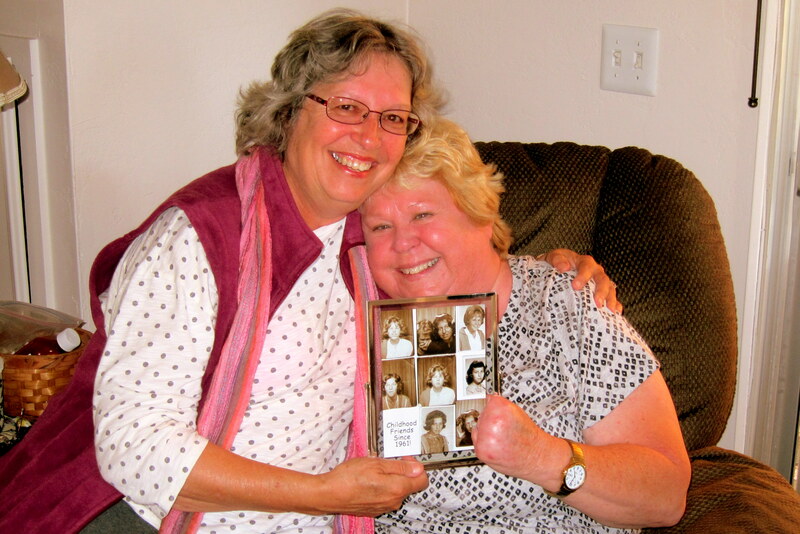 The inscription reads: “Childhood Friends since 1961”……I think she liked the gift as much as Kit liked the flowers! Wednesday, March 16, 2016: Today we head north to the beachside town of Oceanside, but first. 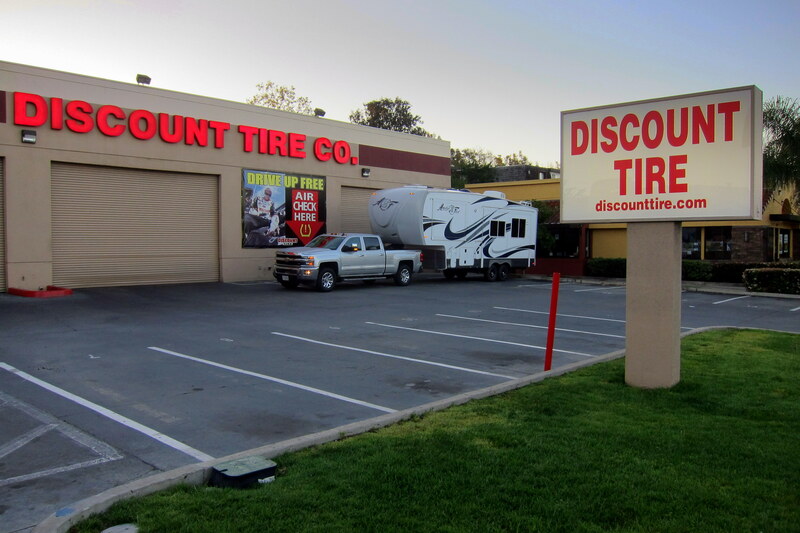 Yep, two new tires for the camper. You may remember that the two rear tires on our new unit have taken a beating, a total of six different punctures over the past 14 months. All in the rear…..how does that happen?!?! You would think that the front tires would be far more vulnerable to road hazards! The death nail (pun intended) was a side wall penetration that was not fixable, so not wanting mismatched wear patterns I opted to get both tires replaced. By mid-morning, we were heading north trying to avoid the Interstate. Wait, what is that car to the left? 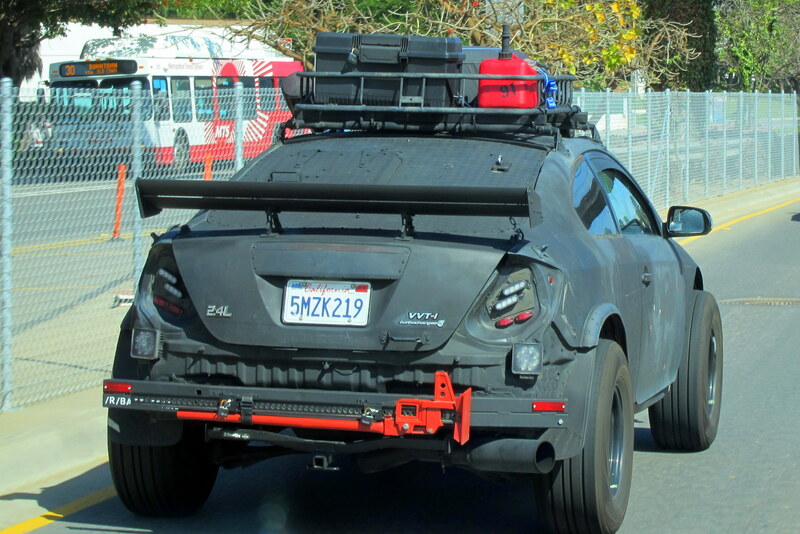 Looks like some sort of Armageddon Vehicle, notice the diamond plate with the gun port that replaces the rear Window? Don’t think I would want to tailgate that fella! 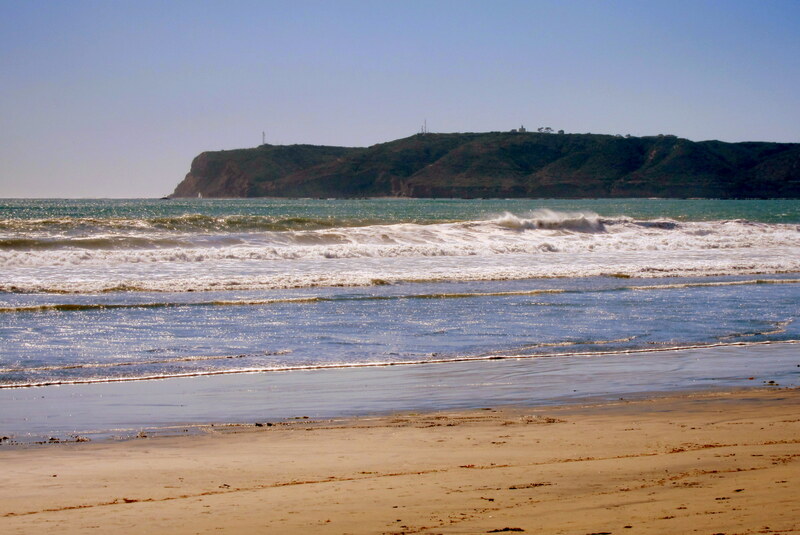 Around noon, we pulled into Del Mar Beach Resort on Camp Pendleton and set up for a two week stay. Following an enjoyable meal, Kit and I partook of a few cocktails while watching the sun set into the Pacific. Gonna be a great two weeks…..stay tuned! 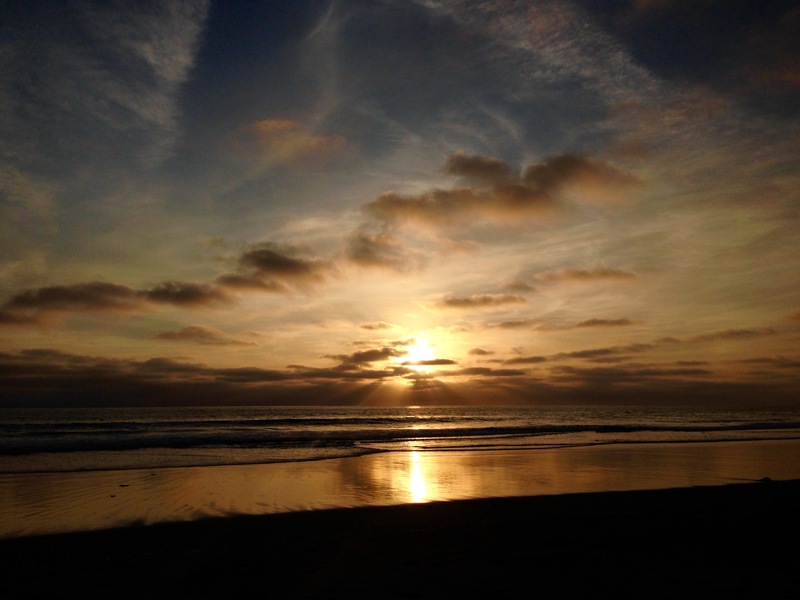 Kit’s Bit’s: We’ve had quite a nice time in So Cal this winter. Exploring several places, we’ve heard of over the years but never seen, has been great! And, you can’t beat the weather there. Warm days and cool nights. We had one storm come through but, for us hardy souls from Maine, it was nothing. We have thoroughly enjoyed visiting with our family and friends and, very excited to camp with my sister and her husband when we return next year! Looking forward to our next “gig” on the beach with Jack and Tucker. Great journal! I have to add Rebate to my bucket list…very interesting place. 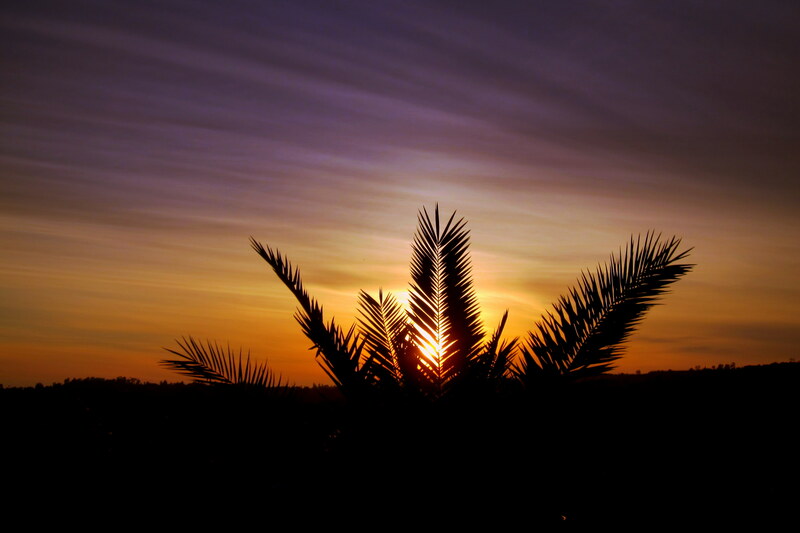 You took some great sunset shots (of course) on this leg of of your trip. Absolutely stunning…..as was Scott and Marie’s home! What a view!!! …. I liked your camping spot at Sweetwater…very unusual with all of the bushes around your camper… I’m guessing you couldn’t fly your kites because of low flying helicopters? KATHY…..HAVE A WONDERFUL BIRTHDAY. I,would ordinarily say do something fun….but…well…you’ve been doing that. WOW!! WHAT AN INTERESTING JOURNAL. YOUR VISIT WITH SCOTT, MARIE AND LIBBY WAS A HIGHLITE. WHAT A BEAUTIFUL HOME THEY HAVE, PLUS A MILLION DOLLAR VIEW. I THINK THAT RATTLER MIGHT HAVE BEEN MADE INTO A GREAT HAT BAND OR BELT. 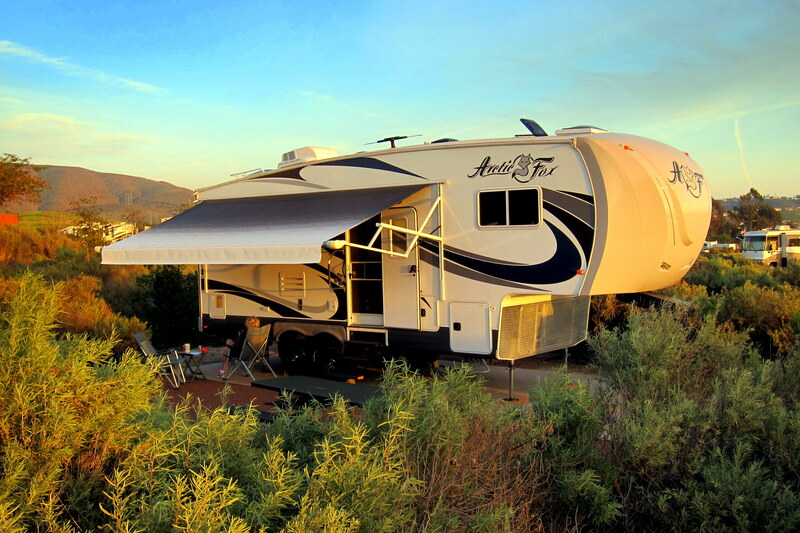 NO QUESTION, YOU AND KIT HAVE MASTERED THE ART OF RV TRAVEL. WHEN YOU WRITE THAT BOOK, SO MANY WILL BENIFIT FROM ALL THAT YOU HAVE RECORDED. WEATHER HERE AS YOU KNOW HAS BEEN QUITE SOFT, THE EARLY ICE OUT FOR US HAS BEEN A NIGHTMARE DUE TO VERY HIGH TIDES AND SOUTH WINDS. THIS CAUSES LOTS OF EROSION ALL ALONG OUR SHORE LINE 600 FEET OF IT. WE HAVE RIP RAPPED SOME 200 FEET OVER THE YEARS BUT MAY NEED ANOTHER PERMIT TO PROCEED. WE PICKED UP NAN AND WINDY AT THE AIRPORT ON THE 6TH, THEY HAD A GREAT VACATION IN MAUI. I’M HEADING TO MONTMAGNY, QUEBEC WITH CODY JR TO HUNT SPRING SNOW GEESE ON THE 19TH FOR A FEW DAYS, THIS IS A TRIP I HAVE MADE SINCE 1968. TONY AND DI ARE BACK FROM GEORGIA SO WE WILL BE GETTING TOGETHER WITH THEM FOR DINNER SOON. KEEP US POSTED AND BE SAFE. I am confused—–is Tecate in CA or Mexico or both?? Awesome photos—-visiting SD is still on our bucket list. Spring really is trying to settle in, rather than just a day or two here and there. I think the second half of April will be warmer. 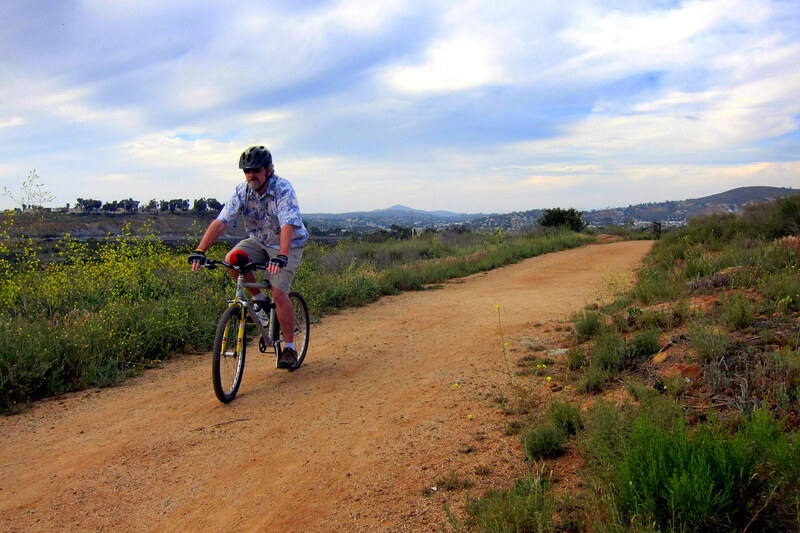 Thank you, Bill and Kit, for a “walk-about” my childhood San Diego County stomping grounds! I believe San Diego proper has become “so very L.A.,” such that it upsets me to go there anymore (although I see you stayed off the beaten path). So I STAY in NorCal, fondly remembering how beautiful and pristine San Diego was in 1966!!! Loving it all, as usual! It’s great that you will now get to do some RVing with Char and Don. I think they should trek to Maine with their new unit! Just sayin’. Would love to see Char again! As always it’s nice that you can reconnect with friends and family, see such interesting places, and just enjoy life together wherever you may be. 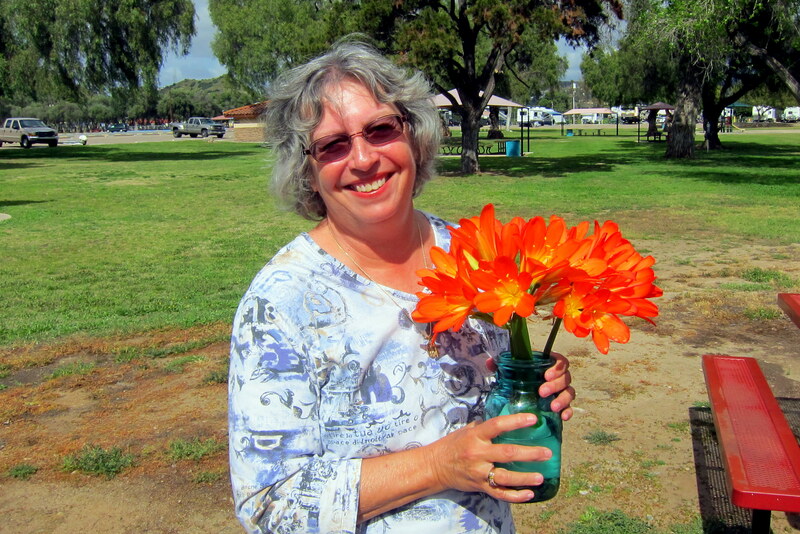 Hope your birthdays were great, and the same to Jane Primmer! Nice to have a little “catch up” from them as well.